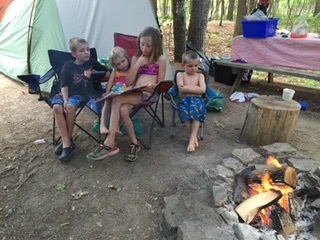 I am camping single-handed with our four children this week. We are still in Ottawa, Canada. Our children are 9, 7, and 4 year-old twins. My husband has left for a week to Bradenton, Florida. He is helping with the refits on our St Francis 50 catamaran, SV Aphrodite. Our planned date to set sail is August 15th. I have camped solo before. When I bicycled the Pacific Coastal Highway in California I did parts of it by myself. I carried a two-person tent on my bike, along with 70 lbs of gear. I cooked over a tiny MSR camp stove. I thrive on being solely responsible for route, distance, sustenance and safety. I like the ultra awareness that this state brings. Often, when I was biking along the California coast, I stayed in the hiker-biker group campsites. You can stay in these sites if you hike or bike in, rather than using a vehicle. For a dollar or three a night, the price is right. But, the drawback is that sometimes the sites attract transients. The population of homeless people was particularly noticeable when I was in Southern California and the weather became warmer. Early one morning, at a coastal campsite near San Diego, I awoke to find a man asleep outside my tent door. My first glance of him was by flashlight, when I illuminated his wooly, red rocks. He was curled up on some newspaper. I packed up my gear with tunnel vision, and he remained asleep. Years later, I can recall the image of his red socks, limp in the toes. It is discomforting to think that I lay sleeping, toe-to-toe with a homeless person, buffeted only by the thin fabric of my tent. But, I was fine and he is perhaps still finding refuge on a California beach. It is difficult to say who was more vulnerable that evening. My prior experience solo camping, and camping amongst people who are mentally unstable, has provided me with some special skills. These skills have raised their head as I provide my children with meals, and a measure of safety here in Ottawa, next to a campsite neighbour who talks to himself. ‘Mama bear’ sums up my reaction to folks while camping. For the most part, our camping neighbours have been great. Our kids have enjoyed playing with other kids. But, it will be nice when my husband returns. Mealtimes and bedtimes have been easier than I thought. But, it will be nice to be able to have a shower alone. As it stands, showering with the twins has not been attempted. Enjoyed hearing you on CBC this morning, Lorraine and Betty! Please let us know if there’s anything we can do to assist – we’ve just returned from upriver, and are leaving today to sail Georgian Bay, but will be back the latter part of July.